According to a new research report from specialist IoT analyst firm Berg Insight, the market for NFC-ready POS terminals continued to show strong momentum in 2017 with annual shipments reaching an estimated 24.7 million units worldwide. The attach rate for NFC was highest in EU28+2 and North America, where 90 percent and 88 percent respectively of the POS terminals shipped featured NFC. NFC was also a very popular feature in many other major markets worldwide, including Brazil, Turkey and China. On a global basis, almost three out of every five POS terminals shipped in 2017 included NFC. Berg Insight projects the global installed base of NFC-ready POS terminals will grow at a compound annual growth rate (CAGR) of 15.6 percent from 54.5 million units in 2017 to 112.3 million units in 2022. 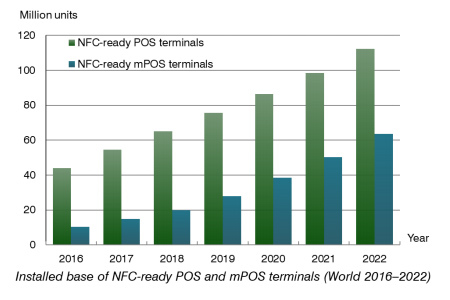 As a result, more than 78 percent of the world’s POS terminals will be NFC-ready in 2022, up from 50 percent in 2017. 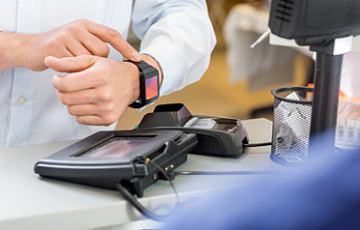 While the installed base of NFC-ready POS terminals has grown quickly, the contactless technology has in many cases not been activated. This is now changing and Berg Insight estimates that approximately 30 million POS terminals accepted contactless payments with Visa payWave, MasterCard PayPass or UnionPay Quickpass at the end of 2017. “The mPOS terminal market is growing faster than the traditional POS terminal segment and there are more than 70 vendors active on the global market today”, said Johan Fagerberg, Principal Analyst at Berg Insight. mPoS is the use of consumer-oriented mobile devices such as tablets and smartphones that function as a point-of-sale terminal to facilitate payment card transactions through a connection to a card-accepting reader. The attach rate for NFC in the mPOS segment reached 53 percent in 2017 as NFC-ready mPOS terminal shipments reach 9.7 million units. Berg Insight forecasts that global shipments of NFC-ready mPOS terminals will grow at a compound annual growth rate (CAGR) of 28.9 percent in the next five years to reach 34.5 million units by 2022.